Two former interpreters who risked their lives working for UK forces in Afghanistan have lost a High Court case against the government for alleged discrimination. Their challenge centred on a redundancy package announced in 2012. Mohammed Rafi Hottak and a man referred to as AL argued they should be given the same rights as Iraqi interpreters, who were allowed to settle in Britain. But judges rejected claims the government's scheme was discriminatory. 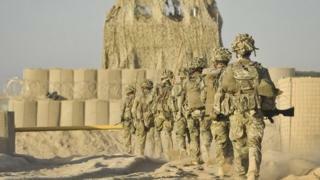 The Afghanistan redundancy scheme was outlined when the prime minister announced the drawdown of UK forces from Afghanistan in December 2012. But it only applied to interpreters who were still serving British forces at the time and who had been employed for more than 12 months. Lawyers for the two men argued they were being discriminated against and treated differently to Iraqi interpreters, who were all given assistance when their lives became endangered through assisting the British in the Iraq war. Rosa Curling, representing the pair, said AL had needed to remain anonymous because of Taliban death threats, while Mr Hottak had already claimed asylum in the UK but had been unable to benefit from the assistance scheme. Lord Justice Burnett and Mr Justice Irwin were asked to declare that the deadline for the scheme made it discriminatory under the Equality Act 2010 and a breach of the common law and the government's public sector equality duty. But they ruled the "territorial reach" of the 2010 Act "is not such as to include the claimants' circumstances". The judges also ruled that the common law claim "has no substance".